Any Aluminum Ornamental Fence of $4,000 or more. Jerith black ornamental fence panels for less than $18.00 per foot. 96’ of 48” High 3 Rail. 16 sections, 15 line posts with caps. 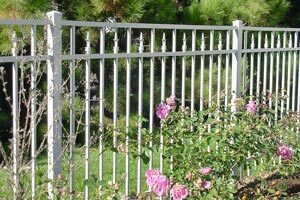 Many homeowners and commercial property owners see beautiful aluminum ornamental fences installed at various locations and think they must be very expensive. That’s a natural conclusion, given their outstanding appearance and obvious strength. In reality, though, these fences are highly affordable, with costs comparable to other popular materials, like wood and vinyl. Less expensive than steel decorative fences in material cost, installation goes quickly, due to the use of modular panels. Simple installation keeps costs down, too, and makes this material ideal for Do-It-Yourself projects. We’ll be happy to give you a free consultation and price quote for a lifetime Jerith aluminum fence. 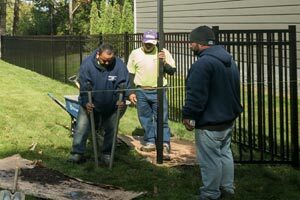 Whether you install it yourself, or have our experienced installation team complete the job for you, you’ll get outstanding value and performance over the long lifetime of your high-quality fence. Total Length – How long your new fence will be is the most important factor in its total cost, since materials are priced by the linear foot. Material costs for a typical Jerith aluminum 4′ high fence, including all posts and fence panels start at a very low price. Gates are priced separately. 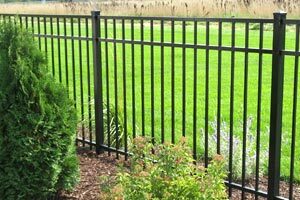 Style Selection – Jerith aluminum fencing comes in a wide variety of styles, each with its own pricing that reflects its complexity, grade, and other factors. Our consultants will be happy to show you all available models, and give you complete price information for your comparison. Height – Heights range from 36 inches to 8 feet. Naturally, taller fences use more materials and cost more than shorter ones. The height you choose should be based on the nature of your goals and requirements. Grade of Materials – Jerith products are available in three grades, Residential, Aero, and Industrial. Residential grade posts and panels are lighter in construction, with Aero and Industrial using heavier-duty materials and larger dimensions. Your choice of grade affects the price per foot. Gate Choices – Gates designed to match each fence style are available in widths from 36" to 72" and with flat or arched tops. These are priced individually and not included in the per foot cost of the fence. In Aero and Industrial grades, sliding and swinging gates up to 20′ long are available. Customizing Accessories – Many accessories are available to help you make your home improvement project unique. Decorative picket tops, post caps and scrolls are available in several varieties. Sold individually, prices vary, depending on size, complexity and finish. We’ll show you every option. Installation Cost – For DIY installation, your cost will only be for the materials, plus delivery, tool rentals and other materials. If you hire us as your professional installer, we’ll give you a competitive price quote, based on time and materials. Our efficiency helps keep costs low. The fence industry is highly competitive, so the cost of identical products doesn’t vary widely between suppliers and contractors. The real difference is quality. Cheap products from big box stores may seem like a bargain, but not all materials are built to last. The USA-made Jerith fences we supply are the highest quality available in design, manufacturing and finish. They’ll last a lifetime, not just a few years. Installation quality varies, too. Some builders cut corners and take shortcuts to maximize their profits. As the most trusted fence company in Minnesota, we always complete the jobs for our customers using the highest standards. Long life, enduring beauty and complete customer satisfaction are how we measure our success. Call us today or visit our Brooklyn Park showroom. We’ll give you a free consultation and competitive price quote for the cost of your fence materials or for a completely installed fence. Make the choice for quality and you’ll get the lowest cost per year over a lifetime of service.